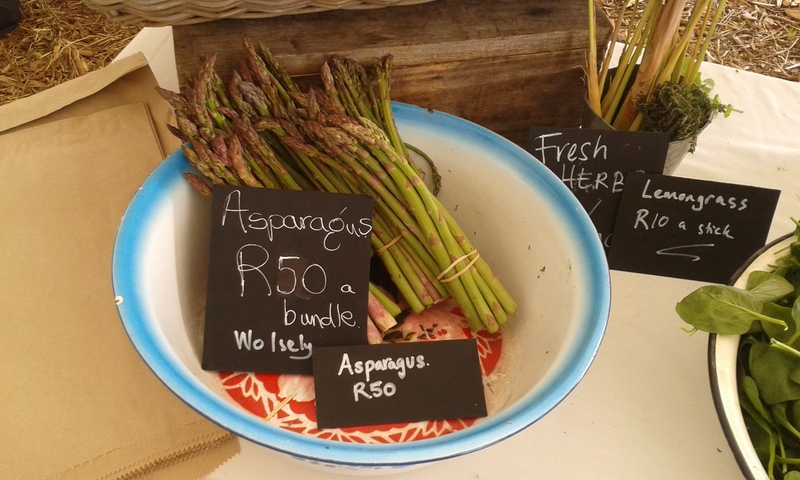 After two years of loving cultivation, and a lot of hard-won lessons, my friend Gabriello Carnazza, a Swiss-Italian former designer now farming in South Africa, sold a batch of asparagus from his first harvest at the Oranjezicht City Farm market for the very first time this weekend. Giove cultivar asparagus, going for R50 a bunch at the OZCF Market Day. All sold out, and we clinked glasses after to celebrate. Like a lot of urbanites, Gabriello had dreamt of living a simpler life, closer to the land. He researched locations and set his sights on the Western Cape, on the tip of Africa – not realising he was actually continuing an old family story. His Sicilian grandfather had once farmed citrus in Africa, in Ethiopia, after working as an engineer on the roads there. “When I told my father, ‘I am going to buy a farm in Africa,’ he said, ‘Not another one,’” says Gabriello, who hopes to make a success where others before him did not. Initially, Gabriello had planned on getting a job in his field, set design. And that’s the back story of how our paths crossed. He was interviewed by my close friend Leon, now Gabriello’s partner. When the employment plan didn’t work out (paperwork issues I think), Gabriello fast-tracked his farming dream. 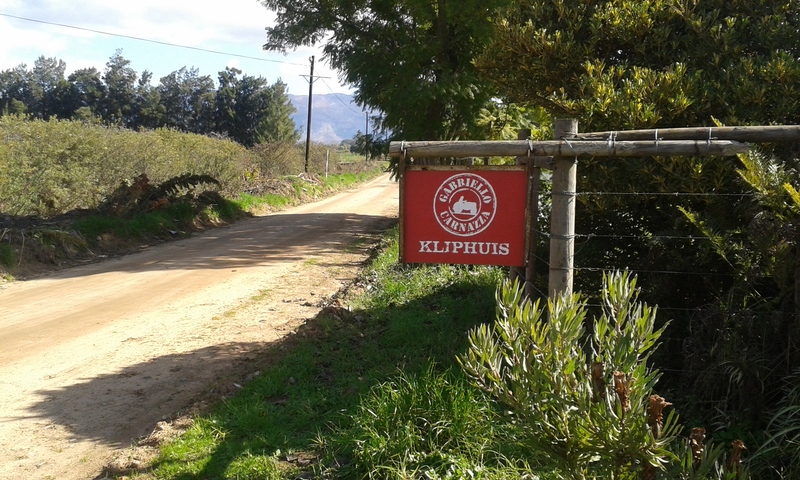 He chose the farm he decided on, named Kliphuis and located in Wolseley, because it was one of the few farms that boasted a beautiful garden around the farmhouse. Wolseley itself is a small town between Tulbagh (part of the Cape Winelands, recently identified as a property hot spot for out-of-towners) and Ceres (the ‘Eden of the Cape’ named after the Roman goddess of agriculture). And asparagus? Well, most of those on shelf in SA are imported, yet the soil and climate in the region is ideal for growing asparagus locally. 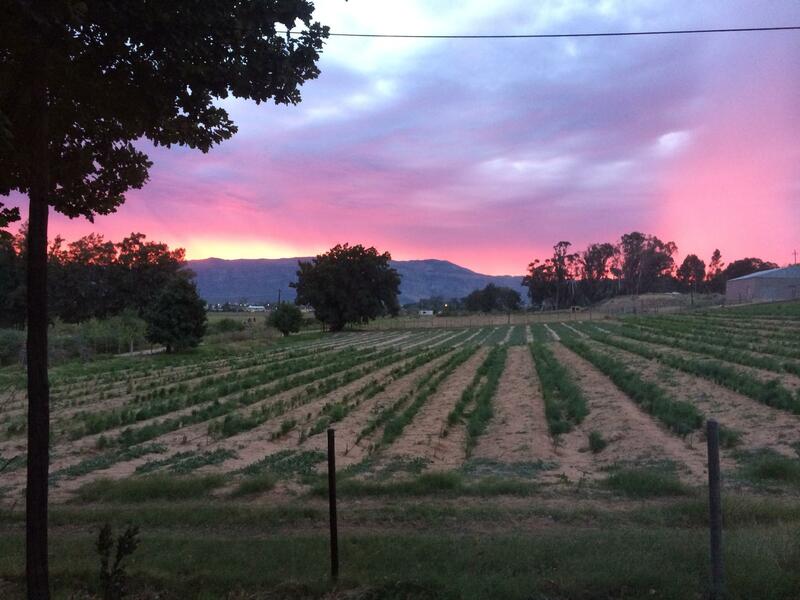 Gabriello’s image of sunset on the farm, asparagus in foreground. 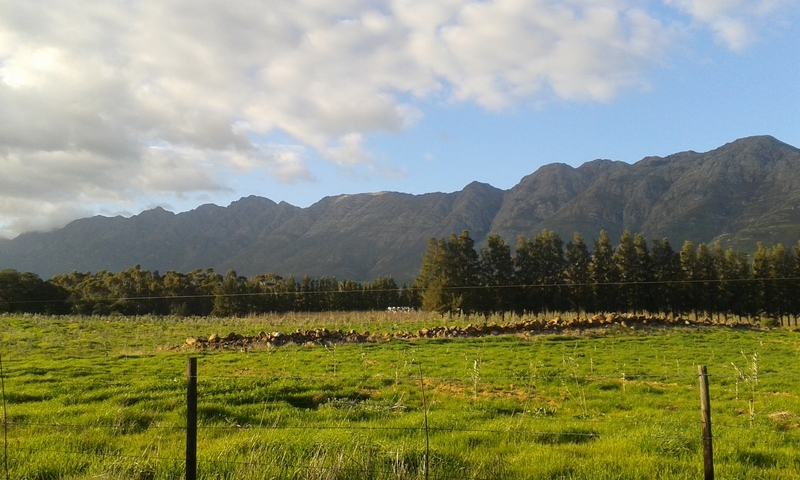 Driving into the Tulbagh Basin from Cape Town (just under two hours’ drive away) is a euphoric experience. The basin, which was inhabited by indigenous Bushmen and Koi peoples for hundreds of years before the Dutch and Huguenot settlers arrived, is surrounded by mountains on three sides. Whenever I dip into it after the Nuwekloof Pass, I swear I can hear Julie Andrews sing, “The hills are alive with the sound of muuusiccccccccccc”. I love that I get to visit the farm. Since Gabriello has an urban sensibility and has pretty much taught himself to farm, he eagerly shares details on plants, growing, harvesting and forming a relationship with the farming community (he’s known as “The Italian” in the village). Gabriello has successfully continued harvesting pears from the 14 000-odd established pear trees in the orchard. He has planted about 1 200 olive trees. And then, his 18 000 beloved asparagus plants (pronounced “aspara-goose” in his Italian accent). Since the first yield was relatively small (compared with what’s expected in coming years), he has sold his first harvest of asparagus to local establishments and those in the city, including the Madame Zingara chain and Chefs Warehouse and Canteen. Beyond the farming, Gabriello has bigger tourism and transformation plans for the farm, including possibly renovating cottages so visitors can come to pick olives and press their own olive oil at the Waverley Hills Organic Wine Estate nearby. He is also using Solms-Delta wine farm, in Franschhoek, as a model for developing projects that ensure his workers will derive a more sustainable economic benefit from the farm, too. I visited Kliphuis earlier this month, for the national Women’s Day long weekend. Here are a couple pictures. To read more on Gabriello and the process of harvesting asparagus, see the profile OZCF did on him here. To join the Kliphuis Facebook page, click here. The entrance to the farmhouse. 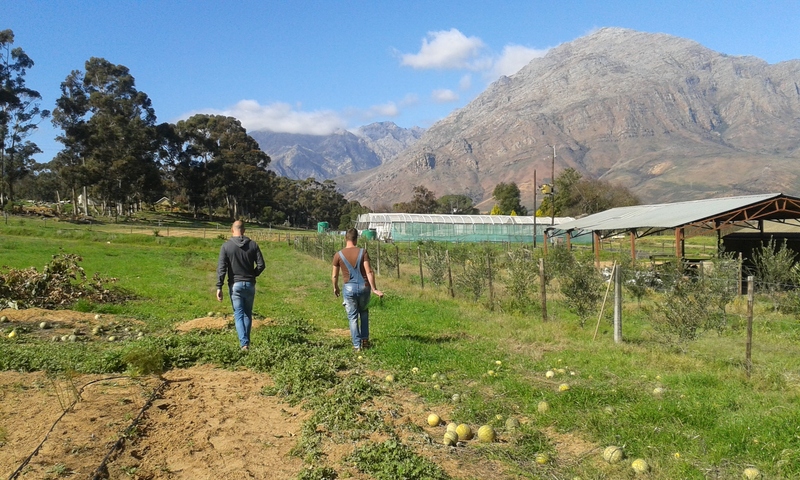 Leon and Gabriello, with Kalahari melon (citrullus lanatus) gourds on ground on the right. 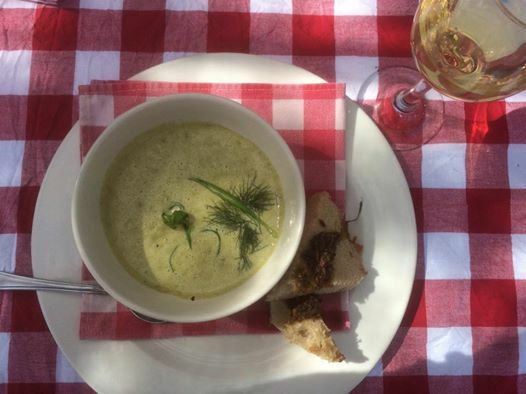 Gabriello’s asparagus in a soup at Mama Cucina Italian Restaurant in Riebeek Kasteel.